The paperwork for benefits claims is overloading claimants who have to prove they have limited capabilities for work and work related activity yet, are expected to manage a huge amount of paperwork. The picture above is the file containing paperwork for one Employment & Support Allowance Claimant, next to it is a standard pack of 500 sheets of A4 paper for a direct comparison. Her claim started in July 2010 but this claimant feels she has yet to be placed in the correct category for ESA. She has not received any benefit for a year because of the 365 day rule for Contributory Based ESA, as she was placed in the Work Related Activity Group. By 365 days a claim should be resolved but instead it has taken nearly 3 years so far. Despite her not being paid any benefit for a year, the responsibility to prove she isn’t capable to work is on her, despite her condition. This puts her in a real catch 22 situation as she is not capable to manage her case, but she has to do her case to prove she is incapable. When it comes to Tribunals claimants are not automatically entitled to help and many have to rely on charities and organisations like the Citizens Advice Bureaux who are being swamped by the volume of people needing their help. This has led to them joining other charities and publishing a report entitled simply “Not Working” about how the benefit simply does not work and overloads anyone going through it. It all rests on the claimants responsibility to collect their own evidence, but if they are too unwell to do this and too unwell to approach these charities they often find themselves not being able to cope with the demands the state places on them. ATOS Healthcare are notorious in the British press and they hold the contract to conduct the Workplace Capability Assessment on claimants. However their notoriety comes from a high volume of clients appealing their assessments as ATOS has found they do not have limited capabilities. Often this decision is then overruled at appeal or tribunal if the claimant (who is incapable of work) puts a strong enough case together. It is a huge problem for claimants when ATOS deem them capable as they then have to gather and often commission there own medical reports in an attempt to show ATOS are wrong and they are in fact incapable of work. This gives them a huge workload and overloads the charities that might be helping them. Today we have heard the volume of requests is also overwhelming GP’s according to BMA Scotland in this BBC Article. But the responsibility for all of this rests with the claimant who are drowned in paperwork, desperate for written evidence from GP’s , Specialists and Healthcare Professionals. As said previously the claimants often have to commission these reports themselves, it is their responsibility. This can cost hundreds of pounds while cases go on for three years despite not being paid any benefit. Often ESA claimants also have to apply for other benefits like Disability Allowance, Housing Benefit & Council Tax relief. 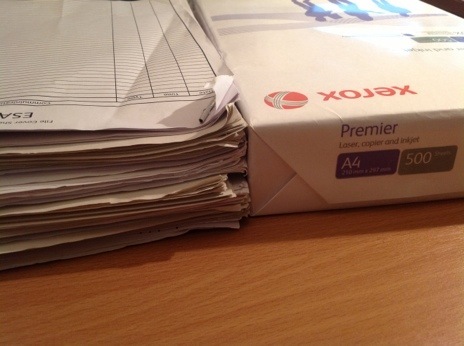 With benefit reform sweeping through these areas claimants are often left with huge files, like the one shown in the picture, for each benefit they apply for. I would certainly agree with CAB when they say “Not Working” as its not working for anyone and the system is simply flawed. Just a quick post to mention that (as the title suggests) I have done a guide for Appeals & Tribunals as they are so common and one of the most frequently asked questions. You can find it under benefits THEN Employment & Support Allowance THEN Appeals & Tribunals Guide on the red menu bar above this post near the top of the page, but to be really kind you can simply click here to be taken there by magic! I am working on a Guide to the ESA50 form for ESA now. Its already feeling like filling hundreds out at once. Oh well my pain is your gain and all that. I thought I would group my next two posts into one as I’ve already blogged twice today! Firstly some rather bizarre news on Fibromyalgia from the Daily Fail (Daily Mail) about a GP who diagnosed herself with Fibromyalgia and then managed to cure herself by not eating Fruit & Veg. A rather extreme case of “five a day keeps the doctor away” (from work)!!! Obviously there is more to it and one thing I take from the story is the importance of keeping a food diary to see if certain foods, groups or properties may be aggravating or causing certain problems. You can read the full story here. Dr Harrington who is behind the controversial Work Capability Assessment that claimants of Employment & Support Allowance must go through is reviewing how his latest recommendations are been implemented. During this process he is asking for people to write to him about there experiences, particularly if you have had more than one assessment. I think it is vital for people with Fibromyalgia to submit their experiences as its not often we get this much of a chance to get our views and experiences under the nose of someone at this level. He will of course receive information from people with any other condition who have undergone the WCA and it’s not just about those with Fibromyalgia. The assessment is literally the practical implementation of the law and the Employment & Support Allowance regulations and the descriptors are part of schedule one and two of the latest update. If you feel like I do that the WCA is fundamentally flawed perhaps it’s worth making our feelings known. Although saying that we are not alone especially after Citizens Advice produced there damning report entitled “It’s not working” which I support. For me neither schedule encompasses the reasons why an individual may not be able to work, and not be able to take part in work related activity. To read more about the information he is after visitthis site and download the document entitled year three call for evidence skipping to page 11 if your limited by time! Well, I’m finding myself awake and getting frustrated about my lack of Employment & Support Allowance. I complained last November and got a response in writing and a promise they were looking into my claim that I should be in the Support Group, gathering more medical evidence and to acknowledge my claims that I am finding it hard to keep up with constant letters going backwards and forwards highlighting poor treatment and even unlawful decisions by decision makers. Well, I’ve heard nothing since November, I’ve had nothing to inform me a decision has been made! I’ve had nothing to inform me a decision has not been made! I’ve had nothing! In the second quarter I was told my ESA had been cut under the new 365 day rule, I wrote another written complaint asking what the hell was going on about my Support Group Appeal. I RECEIVED NO ACKNOWLEDGEMENT OF MY COMPLAINT. To summarise they told me they were looking into my Support Group Claim in November 2011 but I have no result, I have written to complain twice and they are refusing to acknowledge my letters! What do I do? I had requested an appeal over six months ago and complained twice and they just won’t acknowledge my appeals and complaints? What the hell do you do when the Jobcentre plus won’t let you appeal and won’t acknowledge any complaints? Can they just decide not to let you claim benefits, not to allow you to appeal, not allow you to complain if they feel like it? They have done with me! I know it’s against the law for them to do this but I can’t take them to court, I have little money and I’m not medically able to go through it! Should I write to my MP? Should I threaten to publish my whole case online? Should I go to the press? I’m going out of my mind tonight as I’ve finally managed to relieve nearly two weeks constipation (Too much information) and finally have a bit of energy, great, I should be sleeping! Not much chance of that is there? As the title suggest our family income has just taken a dramatic nosedive due to the cuts and benefit changes. How it is all worked out is very complicated so I’m not going to go into detail but the important bit is that our circumstances have not changed, but out income has.